Sher-e-KashmirUniversity of Agricultural Sciences & Technology SKUAST Kashmir walk in-interview for engagement of Lecturers. Walk in-interview for engagement of Contractual/Guest Lecturers for teaching assignments during Autumn Semester 2018 in the below mentioned Faculties/Disciplines shall be held on 18th of July 2018 (Wednesday) at 10.30 a.m, in the Directorate of Education, SKUAST of Kashmir Shalimar. i) Master’s degree with minimum 55% marks or equivalent grade in OGPA or equivalent postgraduate qualification in the concerned subject. * In respect of positions related to Fisheries, the Masters/Ph.D Degree can be in the concerned/ related subject. 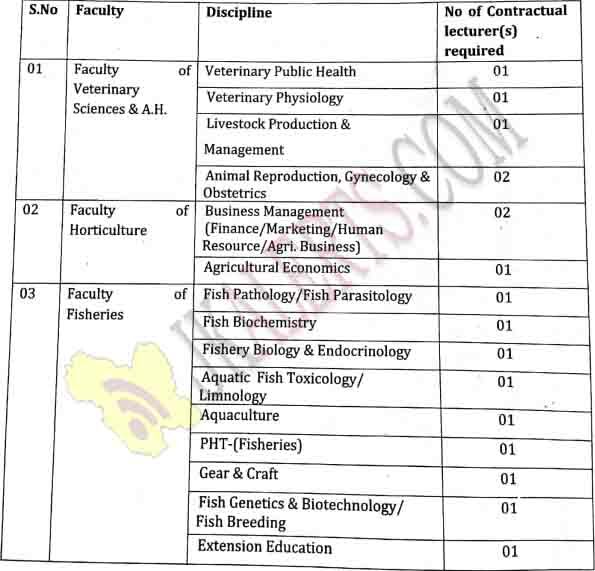 ** For positions in Fisheries the professional degree in the concerned subject shall be substituted by B.F.Sc/B.Sc. (Bio-Sciences) subject to having completed remedial deficiency courses during post-graduation. The engagement shall be purely on temporary academic arrangement on contractual basis for the Autumn Semester-2018 and shall be terminable any time without assigning any reason or if the post is filled-up on permanent basis. » The Guest/part time teacher shall be paid @ Rs. 1000/= per lecture subject to a maximum of Rs. 21500/= p.m.